The United States and Russia may be moving closer to an understanding on the conflict in Ukraine, writes Stratfor, the global intelligence company. In recent weeks, diplomatic activity between US and Russian officials has resumed at a frenzied pace. There are rumours of a political reshuffle in the separatist territories of Donetsk and Lugansk. Ukrainian and Russian media have even reported that a “secret deal” is in the works that would serve as a compromise between the political and security demands of the separatists and Moscow, on one hand, and Kyiv and its Western backers on the other. Yet there are plenty of reasons to be skeptical of such rumours. Ukrainian officials have made unequivocal statements that there would be no political concessions from Kyiv until Moscow completely implemented the security provisions of last year’s Minsk agreement. These provisions include the withdrawal of all foreign — meaning Russian — troops in eastern Ukraine as well as the restoration of control of the border between the separatist territories and Russia to Ukraine. Meanwhile, Moscow has reiterated that Kyiv must pass key constitutional changes that would grant greater autonomy to the separatist regions before the security components of Minsk are implemented. The Ukrainian conflict has already had its fair share of fruitless negotiations and cease-fire breakdowns. Simply continuing the status quo would understandably be more likely. But the drop in global oil prices and the subsequent weakening of the Russian economy, as well as Russia’s extensive involvement in Syria, could be giving new life to negotiations among Kyiv, Moscow and the West. A grand bargain over Ukraine is far from near, but there may be room for compromise over what so far have been intractable issues. Talk of a potential deal began when US Assistant Secretary of State Victoria Nuland held an unannounced meeting with Russian presidential adviser Vladislav Surkov on 15 January. Nuland, who was at the time in the middle of a tour of EU and NATO countries in Eastern Europe, flew to the border of Lithuania and the Russian exclave of Kaliningrad to meet with Surkov. The meeting, which reportedly lasted over four hours, immediately led to speculation of a “secret agreement” between the United States and Russia over Ukraine. The details of what the deal would entail have varied from source to source. Some outlets claimed the separatist Donbas region would formally be part of Ukraine’s territory but would be given special status and allowed to conduct its own foreign policy. Others reported that Russia would concede on granting Ukraine control of its border with the separatist territories. Some even suggested that Russia was considering replacing current leaders of the Donetsk and Lugansk separatist territories with figures who are more cooperative with Kyiv in a bid to move negotiations forward. US Secretary of State John Kerry then met with Russian Foreign Minister Sergei Lavrov in Zurich on 20 January. Just two days later, Kerry said at the World Economic Forum in Davos that US sanctions against Russia could be lifted “within months” if the Minsk agreement were fully implemented. The statement was notable, since the United States has taken a hard line relative to European countries on maintaining sanctions against Russia. But while the European Union recently voted to extend sanctions on Russia for six months, several European officials have made it clear that they wish to lift EU sanctions on Russia when they come under review in July and have pressured Moscow and Kyiv to do more on implementing Minsk protocols. For Russia, getting sanctions removed is paramount. The drastic drop in global oil prices has caused Russia’s budget, which depends on energy revenues, to shrink and its deficit to explode, and the ruble is becoming more volatile. Oil prices could continue to fall, but even if not, sustained low oil prices over the next year or two put Moscow in a precarious position. Thus, Moscow is reconsidering its position on Ukraine, perhaps becoming more accommodating with Kyiv and the West, as Surkov’s meeting with Nuland would suggest. Of course, Russia has not been the only country to suffer economically as a result of the crisis. Ukraine’s gross domestic product contracted by 10% in 2015. European countries such as Germany and Italy have struggled under Russia’s countersanctions against the European Union as well. Every party would benefit significantly if restrictions were lifted. If economic conditions instead become worse, the sheer economic pain could drive them to break their political impasse over the conflict in Ukraine’s east. Another component that could drive negotiations is the ongoing conflict Syria. Russia has become involved in Syria on the side of President Bashar al Assad’s government, conflicting with US and European support for certain rebel factions. But both Moscow and the West share a common enemy in Syria: the Islamic State. There is also the potential for more general bargaining. Russia could exact concessions from the United States on NATO’s buildup in Russia’s periphery, just as the United States could get Russia to cooperate in negotiations over the political future of Syria. Both sides are still working on opposite ends of the fight, but their shared interest in containing the security threat of the Islamic State, which has struck both Europe and Russia, presents an opportunity for cooperation on other issues. However, Moscow is unlikely to completely surrender on Ukraine. The Kremlin traditionally prioritizes Russia’s national security interests over its economic development. Russian President Vladimir Putin is well aware of the consequences of former Soviet leader Mikhail Gorbachev’s geopolitical concessions to the West in exchange for economic support, which contributed to the Soviet Union’s collapse. Putin is also aware that giving away major concessions on Ukraine without anything to show for them could be more disastrous for his political position than the economic pain that Russia has had to endure. After all, his popularity among the Russian public remains quite high despite the economic crisis — at least for now. Ukraine will not unilaterally concede in a substantial way either. The austerity measures the staunchly pro-West government in Kyiv has pursued to gain financial assistance from the International Monetary Fund have made the Ukrainian government extremely unpopular. The government has also stalled reforms in the judicial and legal sectors, hurting the ruling coalition led by Ukrainian President Petro Poroshenko and Prime Minister Arseniy Yatsenyuk. Yatsenyuk’s People’s Front party has polled so low in recent months that it did not even participate in local elections, and there are indications that a government shake-up in Ukraine — potentially costing Yatsenyuk his position — may take place in the coming weeks. Nationalist and far-right groups such as Right Sector and the Svoboda party are also confronting Kyiv, calling for a more aggressive stance against the separatists in eastern Ukraine. Though these groups have fought alongside the Ukrainian military in the east, they have clashed with Ukrainian security forces in other areas of the country as well, remaining outside Kyiv’s direct control. Granting greater concessions to Russia and the separatists would likely instigate a conflict with far-right groups. With the government already weak, such a conflict could be the tipping point for Kyiv, perhaps explaining why the Ukrainian government has remained adamantly opposed to political concessions to Russia until Moscow implements its end of the Minsk agreement. And while EU countries such as Germany, France and Italy have a clear economic interest in lifting sanctions against Russia, other European states such as Poland and the Baltic countries want to maintain sanctions until Moscow fulfils its Minsk agreement obligations. The United States has even less incentive to compromise on sanctions, since Russia’s economic and political position has weakened and, from Washington’s perspective, Moscow still has not given enough ground in eastern Ukraine to justify lifting sanctions. 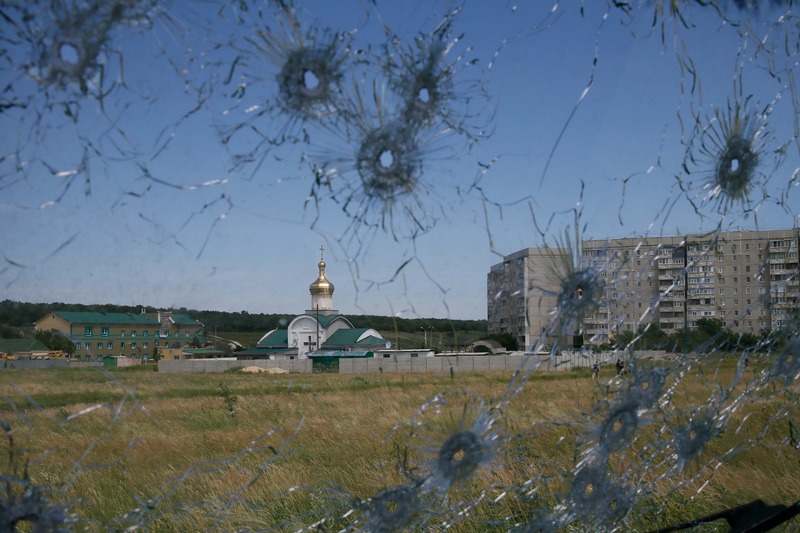 So what areas in the Ukraine conflict can realistically expect renewed negotiations? The issue of local elections in the separatist territories appears to have been a focus in recent diplomatic talks. Holding local polls in Donetsk and Lugansk could lessen the more prickly political differences over the status and autonomy of the breakaway territories. However, for local elections to be held, Russia and the separatists would have to cooperate by completely observing the cease-fire, removing heavy weaponry from the front lines and granting Organization for Security and Co-operation in Europe observers access to the warzone. If Russia followed through with such measures, the West could seriously consider lifting sanctions against Russia. Ukraine and the United States are likely to stress that a complete removal of Russian military and security personnel from the separatist territories and restoring control of the border to Ukraine will be required to lift sanctions and hold early elections. However, even some cooperative gestures by Moscow on security could build enough momentum for both to occur. The rumours of a potential deal in the works may be just that — rumours. There is certainly a lot that stands in the way of an end to the conflict in Ukraine. But recent developments suggest Kyiv, Moscow and the West could be more open to advancing negotiations in the coming months. They should be taken seriously. This is not a one sided issue as Stratfor would like everyone to believe. Right Sector and the Svoboda party are Kyiv’s Achilles heel toward implementing the Minsk protocols. On the realistic front Russia and Assad will soon boot Washington out of Syria once and for all. The way I see it, Washington is just trying to save face against a backdrop of the ever popular graft and chaos that has been a hallmark of Ukrainian nationalism since it’s most recent inception.